The local Left's reaction to my earlier post illustrates why political discourse in this country has degraded to the extent it has. Most people have enough common sense to understand that right and wrong do not depend on ideological perspective or party affiliation. Yet, when presented with a case of I-69 opponents clearly stepping over the bounds of reasonable political discourse, local Leftists circle the wagons and raise the shields. 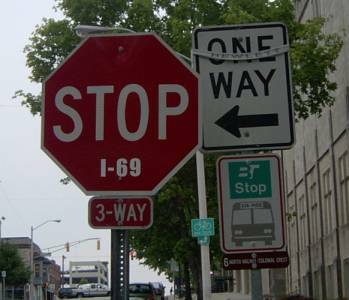 Let me be very clear: every single person reading this post knows beyond a shadow of a doubt that if the stickers on the stop signs said "Abortion" instead of "I-69", the local Left would be having a conniption fit. They would be blasting pro-life activists for defacing public property to promote their agenda. Greg Travis of the Association of Monroe County Taxpayers questioned whether there truly are any options for the average citizen to express himself legally. Travis complained that INDOT "has declared the 'comment period over' (without ever seriously taking comments), there is no referendum, there is no peaceful and lawful way to address the issue -- in fact, there never was." Does this mean that defacing public property is somehow justified? In any case, Travis is wrong. Every two years, the entire State House of Representatives goes before Hoosier voters. Every State Senator must face the voters every four years, and Hoosiers choose who will be in the governor's mansion every four years. Opponents of I-69 also have the option to stage public protests, write letters to the editor, and lobby their legislators. Highway opponents have done all three. The fact that highway opponents have been thus far unable to stop the 3-C route for Interstate 69 in no way invalidates the presence of those legal methods. No one is trying to stomp out dissent by condemning defacement of public property or saying that defacing of public property should stop. Yet when confronted with that reality, Travis sarcastically said "I like to say that over and over in my head, except that I add a german (sic) accent when I do." The inanity of that statement (and disrespect for victims of the Holocaust) is clear. It is the ideological/partisan litmus test that is one of the primary reasons why political discourse in this country has, in many cases, become a sewer. Rather than taking a stand based on principle, too many people make a judgment based on whether the person taking the action is on their "side". This destroys any chance of finding common ground, because politics becomes a contest between cliques rather than a debate between people with genuine philosophical differences. Sadly, this is true on both sides of the ideological divide. People who wish to find common ground are discouraged and disgusted by the partisan inanity. They see both sides out to "get" the other or to "protect" one of their own, but few principled, consistent stands. Why bother voting or participating in the political process if principles take a back seat to partisanship? As for me, I do not care what the message is when it comes to defacing public property. While I oppose abortion, I would strongly disagree with any pro-life activist who defaces public property in order to spread a pro-life message. I am sure there are opponents of Interstate 69 who are appalled by whose who would deface public property to advance their cause. If American political discourse is going to be strengthened and the American people are to have faith in the political process Things must change. Both sides of the political divide need to stop acting like they are in a high school clique and start acting like serious participants in the political process.